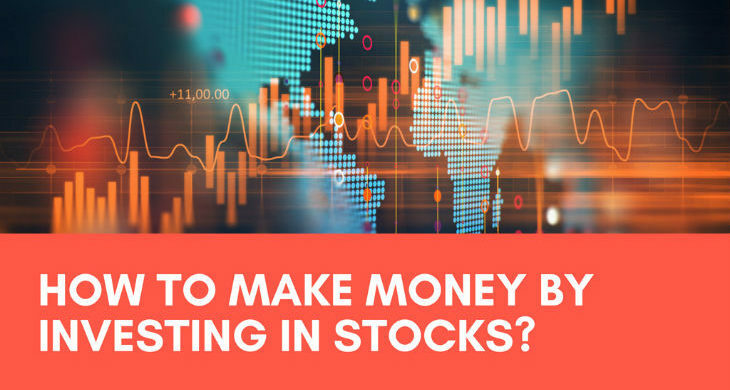 Learn Market Online > Education > Financial markets > Stocks > How to make money by investing in stocks? If you have been a follower of news headlines you might have built a false impression that making money on the stock market involves lots of time and effort, that your main activity will be watching boring charts sitting glued to the screen and generally spending most of the tie contemplating about recent performances of Dow and S&P 500. Nothing can we further away from the truth. The secret to successful investment in the equity market was generally summed up by the prominent forefather of value investing Benjamin Graham, who stated that profitability of the equity market investments comes not from the speculative activities, like buying and selling in the short term, but out of moving and holding securities, receiving dividends and taking advantage of the long-term increase in the value of securities. To say it simple, as an investor in the stock market you need to make decision to invest in the long-term rather than speculating on short-term price fluctuations. This implies lots of research and analysis to be made before making an investment, including choosing a well-run company with strong finances and a history of satisfactory performance from shareholder’s standpoint. Still, the majority of investors barely understand the principles, which lie behind success on the equity market. Few are familiar with success stories of such visionaries as Warren Buffett and Charlie Munger who raised extraordinary fortunes on stocks they held for 25 years or more. As such, investment on the stock market requires extraordinary amount of patience and consistent investment discipline that you have to uphold on the daily basis. When you buy stock, you buy a piece of a company. Imagine a company has generate sales worth of $11,000,000 but made a net profit of $1,000,000. With the idea to raise additional funds for expansion, the company approaches an investment bank and settles arrangements for an IPO (Initial Public Offering). The investment bank will make a full due diligence on the company and asses the value of its stock. It is safe to assume that on this stage the underwriters could come with an offer to cut the company into 440, 000 pieces with $25 share price. That implies that each share will is entitled to $2.72 of profit that serves as an indicator of company’s profitability. Were you to acquire 100 shares for $2,500 ($25 * 100), you would be buying $272 in annual profit plus whatever future growth (or losses) the company generated. If you believe that company’s expansion will significantly increase its profitability and thus affect share price and estimated profits per share, that it appears that you’re up for really good investment. But the final profitability of your investment will be determined of how company’s board of directors and management will allocate the funds raised through the IPO. This will determine the success of your stock holdings significantly. By the end of the fiscal period you will receive dividends ( part of company’s profit distributed to shareholders) which you can use for purchasing more shares or spend it the way you believe is right. You should also take into consideration the sphere or industry where the company is operational. Business climate and general market environment should be taken into consideration. Such things as monetary policy, interest rates, regulatory framework and general trends in the industry should be thoroughly analyzed before arriving at investment decision. For example, if the nation’s economy where company is mostly operations faces economic slowdown or recession – you probably should abstain from investment until the situation clears. Another things worth taking into consideration is company’s balance sheets. This requires understanding of some complex accounting terminology to develop a deeper understanding of company’s performance. Being familiar with such terms as “Assets and Liabilities”, ‘Gross Income” and “EBITDA” is highly recommended for better insight into company’s profitability. Ultimately, any money you make from your stocks comes down to a handful of components of total return, including capital gains and dividends – components highly dependent on the company’s performance. You need an account with a reputable stock brokerage to make your investment pay off. Most of the stock brokers out there are good companies with billions of client’s assets under management. As such, the choice of a broker is a matter of your personal preference and should be determined by the range of services and trading instruments that company provides. Brokers are generally classified into 2 types ; full service brokers an discount brokers. By opening an account with a full-service broker you can rest assured that all you will receive proper guidance on your investment choices and will have all your issues properly addressed. Discount brokers on the other hand, leave most of the work to the trader and are unlikely to provide full account management services on customer’s behalf. The advantage of choosing a discount broker is much lower cost; regular brokers usually charge you quite hefty amounts for their services. Plus, assuming you begin slowly, you’ll learn a whole lot more about investing if you do some of the work yourself.